Five of University of California, Santa Barbara’s most talented student DJs took to the stage Thursday night and battled it out for a spot in the lineup for Extravaganza 2016. 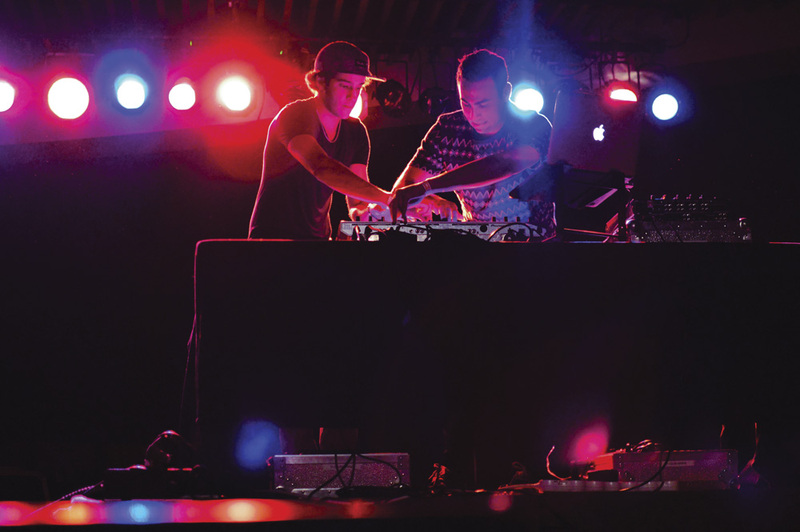 The five DJ’s — HallYourBass, Comrad, Avocado Fries, Taikon, and KhoaBe — each performed a 20–30 minute set in front of several hundred UCSB students. The Hub, illuminated with fierce red and cool blue lighting, bumped to the beats and bass drops of the DJs’ creations. Students crowded onto the dance floor and greeted each DJ with loud applause. Comrad followed HallYourBass’s act as the second DJ in the battle. The audience greeted him with loud applause and chanted his name when his set ended. Comrad had a focused manner about him as he performed, yet elicited high applause and excitement from the audience nonetheless. Avocado Fries, a DJ duo of third year psychology major David Burkow and fourth year political science major Nick Goncharov, was the third act to perform at Battle of the DJs. Their deejaying style was incredibly dynamic; they reached over each other’s arms and hands, fiddled with knobs and adjusted settings on the computer without missing a beat, almost as though a sort of telepathy occurred between them. Telepathy or not, their dynamism proved charming and unusual. It seemed as though their style shouldn’t work, yet it did in many ways, and in ways enough to elicit major excitement from the audience. As their set ended, chants for one more piece reverberated through the Hub, but AS Program Board knows how to stick to a schedule. Taikon and KhoaBe followed next as the fourth and fifth sets, respectively. Both were solo acts that mixed focused deejaying with short bursts of interaction with the audience. The audience was very receptive to these moments of communication with the DJs. The DJ special guest of the night, Lakim, performed for approximately 45 minutes after KhoaBe finished his set. At this point in the night, students danced freely and waited for the announcement of the winner. Around 11:30 PM, AS Program Board announced KhoaBe as winner of Battle of the DJs. KhoaBe will perform in front of UCSB students at this year’s Extravaganza.